I've been in New York for nearly two weeks, and I am ready to make some lists. - The subway system. It's so much better than MUNI. You guys don't even know. - Mazipan rugelach from Breads Bakery. All the halva samples from Seed + Mill. Crinkle cut fries from Shake Shack. REAL BAGELS EVERYWHERE ANYWHERE ALL THE TIME. The Bee Sting pizza from Roberta's. Delis, delis, delis. - I can get currants here! They're not a thing in California. It's weird. I want to make red currant champagne popsicles. But does champagne freeze? Should I find out? The answer is yes. - Humidity. That is not really A Thing in San Francisco and Portland. Or, if it is, those crazy West Coasters don't really know what they're talking about. Ehem. - All my friends are in Brooklyn, and I am all the way in uptown Manhattan. Privileged whinnnneee. I get it. I'm just another insufferable millennial. I'm allowed to have those moments occasionally? - The lines at the Trader Joe's in the Upper Westside. They have people holding up signs marking the end of the line. How will I get my orange chicken. How. - Apartment hunting. Yes, apartment hunting! In New York City!!! No joke — it's actually SO MUCH BETTER than in San Francisco. We are looking at places with exposed brick, industrial windows, and A DISHWASHER. There's more to choose from, agents actually respond to my texts and go out of the way to send me apartments they think I'll be interested in (I am floored by this — are my standards low?! ), and I'm not competing with all the jerks from Google/Facebook who offer to pay $1000+ more than the Craigslist asking price and/or pay the first 6 months rent in cash upfront. Not even joking. San Francisco needs to go. - I don't know where anything is yet. Where do I find the best croissant in NYC? Where do I get my groceries? Where's the best farmer's market? Where do I get my hair cut for not a crazy price? Where do I buy a mirrorless camera? Which Whole Foods is The Best Whole Foods? Is it a mistake to get a taco here? Is the cronut still a thing? All you New Yorkers, HELP ME. - My new (temporary) oven is scary and weird and European and I don't understand it. - I still haven't unpacked any of my stuff. And I'm probably not going to until we get our own place. Because I don't want to pack up all 24 boxes all over again. Literally all my baking stuff is not very accessible at the moment, and I have not baked anything since I left the west coast. Luckily, I have a smattering of recipes that I prepared* in San Francisco for you loyal readers! *Because of course, when I say "prepared", I really mean "the desserts I frantically baked two weeks before I moved from ingredients I was panic-purging from my fridge/freezer/pantry", ehem. Some of those leftover ingredients were a couple of passionfruits (leftover from this passionfruit curd pie) and some passionfruit puree (leftover from these passionfruit curd donuts), enough to make this pretty tart! 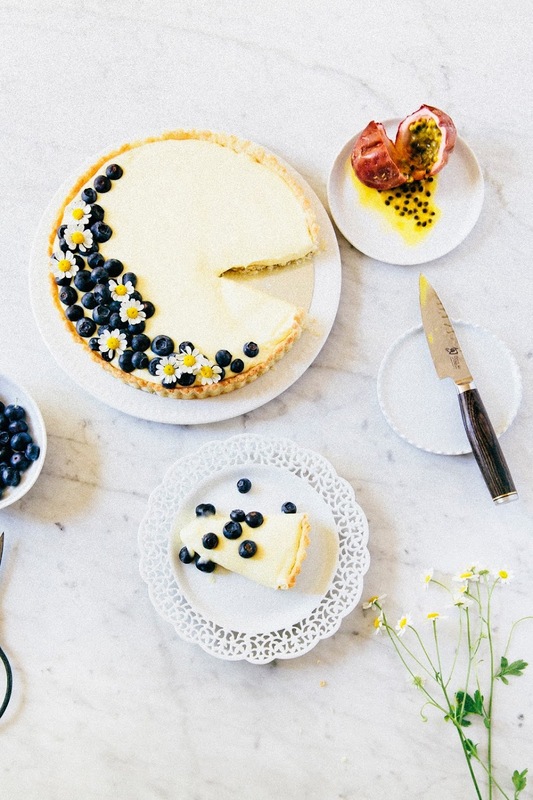 If you've been reading my blog for a while, you'll be familiar with my undying love for Tartine Bakery's lemon cream tart recipe and my dedication to using it as a base for many other dessert variations (see: lemon and coconut pie jars, fresh fig and lemon tart). 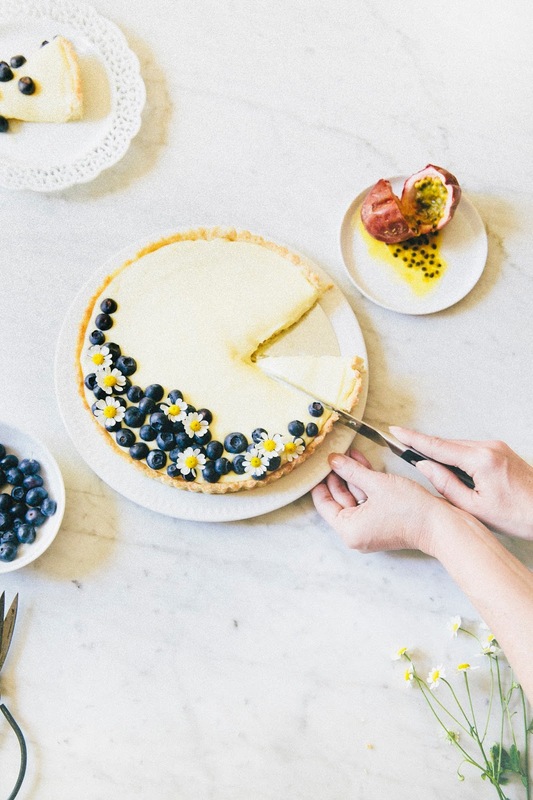 This passionfruit cream tart is another one to add to that repertoire — it's basically that lemon cream tart recipe I love so much, but made with passionfruit juice instead of lemon juice! The end result is less tart than the regular recipe, but equally creamy, delicious, and flavorful. 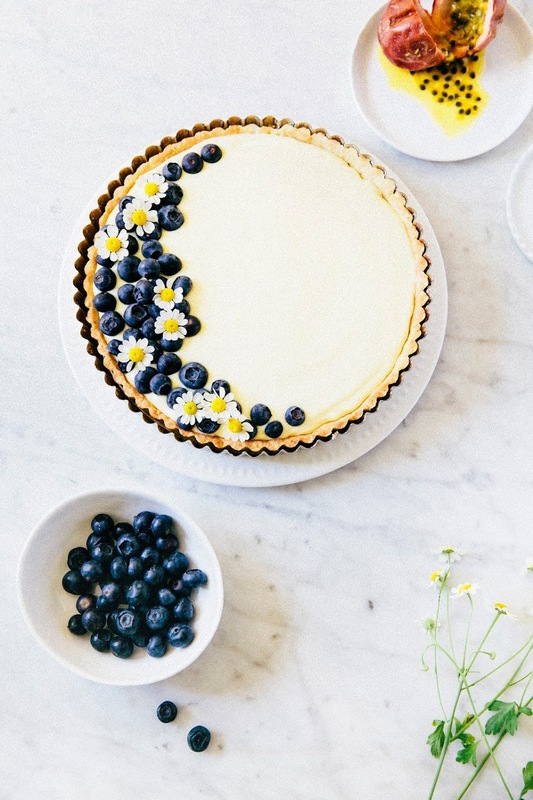 Also, I topped that shiz with blueberries because I have been intrigued by the passionfruit and blueberry flavor combo ever since Sam posted these Portuguese egg tarts. It's good. PS — thanks Nicole for the hand modeling! This crust is easy to put together, but sometimes it does have a tendency to crack here and there. Use a European style butter that has more fat than American butter (e.g. Plugra butter, and Whole Foods often has other brands including a generic version) to minimize cracking. If you don't want to bother sourcing European butter (which I often don't, because I'm cheap and lazy), simply reserve a pinch's worth of raw dough to spackle into any cracks when the tart is fresh out the oven and cooling on a wire rack. 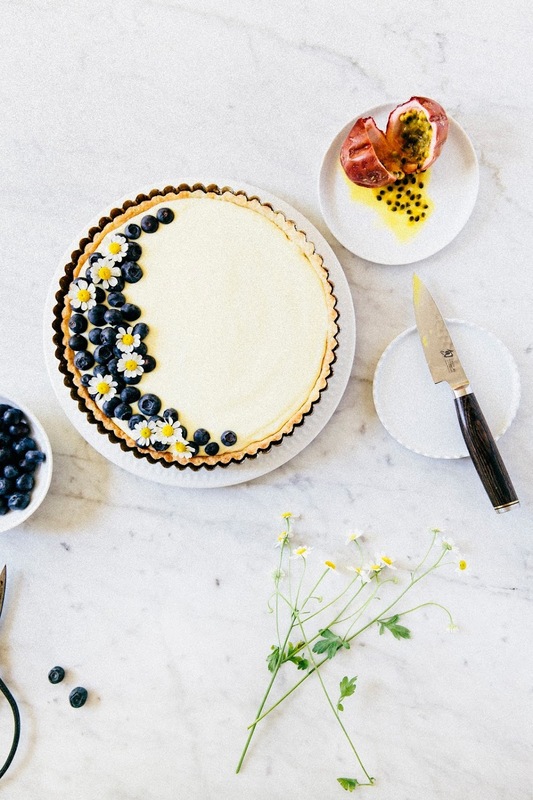 There's no need to bake again — the residual heat from the tart will bake the dough. When working with any citrus juice (or really, most acidic liquids), be sure to use a non-reactive glass or ceramic bowl or pot! Using a stainless steel or even copper one will cause a reaction that will leave your curd tasting metallic. Since the passionfruit and lemon juices sit in the bowl for a long time, it makes a big difference in flavor when using a glass bowl. This recipe works best with a quick-read thermometer (FYI — I really, genuinely love my quick-read candy thermometer), but you can wing it without one. Just keep whisk the fruit juices, eggs, and sugar for around 10 to 12 minutes, until the mixture thickens enough for a whisk to leave a trail behind. And now, this is going to sound really weird, but place the bowl in the preheated oven for 15 minutes, until the mixture is boiling and the butter starts browning. After 15 minutes, remove from the oven (but keep the oven on! ), and add 6 ounces of all-purpose flour by quickly spooning in flour in 1 tablespoon sized chunks. Use a heatproof rubber spatula to stir in the flour. As you do this, the mixture is also going to bubble and smoke, but trust the recipe! It works, I promise. The end result is a dough that pulls off the sides of the bowl and looks a little bit like a lump of mashed potatoes. Once the dough is cool enough to touch, transfer the ball of dough into an 8-inch tart pan. Use the back of your hand to flatten out the dough onto the bottom of the pan, and your fingertips to mold the dough up into the corners and sides of the pan. It's going to feel really greasy and kinda unpleasant, but go with it. Once the tart dough has covered the pan completely, use a fork to poke several holes into the crust. Bake at 410 (F) or until the crust is light brown and starts to appear flaky around 15 minutes. Remove carefully from oven and let rest on a wire rack. Combine 6 tablespoons passionfruit puree, 4 tablespoons lemon juice, 3 large eggs plus 1 egg yolk, 3/4 cup sugar, and a pinch of salt in a glass bowl. Place the glass bowl over the saucepan containing the simmering water to create a double boiler, ensuring that the bottom of the bowl does not touch the water. Whisk until the mixture becomes very thick and registers 180 (F) on a quick-read digital thermometer. As you're whisking, be sure to never let the egg yolks and sugar sit together for more than a moment without stirring – the sugar will cook the yolks and turn them granular! Don't let that happen, or your tart will be weirdly textured and I will cry for you. After the mixture reaches 180 (F) (after around 10 to 12 minutes), remove the bowl from over the water and let cool on a wire rack to 140 (F), stirring gently from time to time to release the heat. Once the mixture reaches 140 (F), use an immersion blender to blend 1 cup unsalted butter a few cubes at a time into the lemon curd. Blend well after each addition of butter and make sure the cubes are fully incorporated before adding the next few pieces. As you add more butter, the cream will start to turn into a pale yellow with take on a thick, opaque texture. 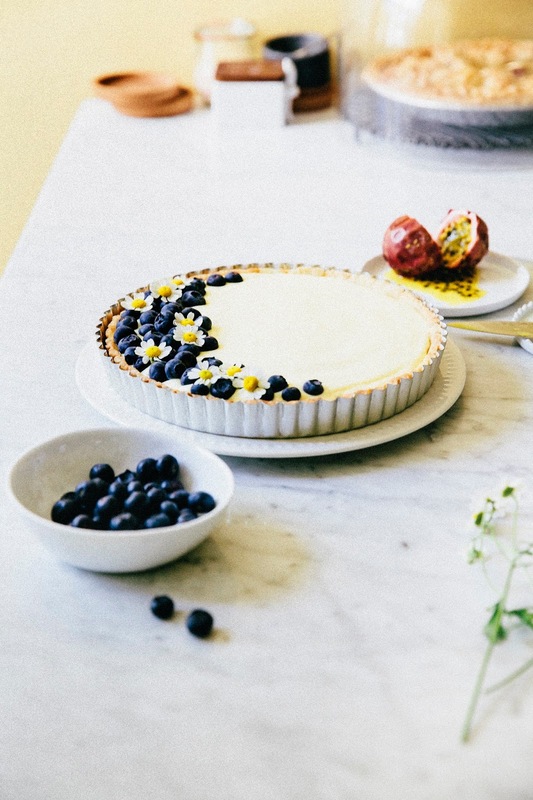 Once the passionfruit cream has chilled for a few hours and you're ready to serve the tart, use a rubber spatula to carefully pour the mixture into the prepped shell, smoothing out with an offset spatula so that it spreads around the tart pan evenly. 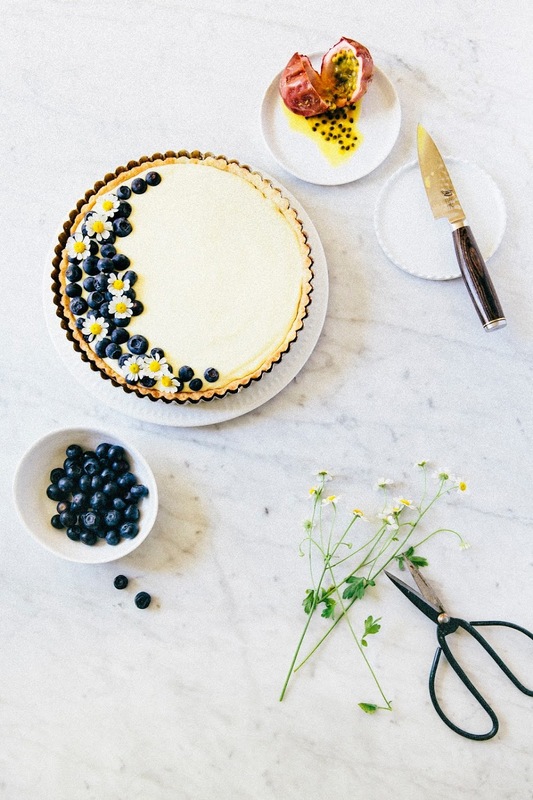 Decorate with 1 pint fresh blueberries and serve immediately.